“Celebrating Life’s Stories” is the 2018 theme for National Skilled Nursing Care Week (NSNCW), formerly known as National Nursing Home Week. Today we honor Wally Taylor. Wally Taylor was born in Clark County, Winchester, in 1934. He lived his entire life in Kentucky except for four years he spent in the Air Force. 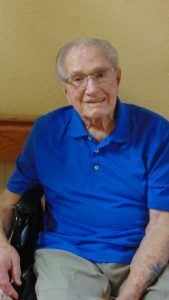 Wally was married for 36 years and has been a widower for 17 years. He has 5 kids, 4 boys and 1 girl and some grandkids as well. Wally spent a 36-year career working for Kentucky Utilities. He began as a lineman then worked his way up to Foreman. His Hobbies are fishing and working on old automobiles. His biggest fish that he ever caught was a 5 lb bass in Herrington Lake. He had a bass boat that he was really proud of. Furthermore, He enjoyed working on Chevy cars. He recalls specifically working on Chevys from 1934 and up, but his favorite was a 1964 Chevy 409. When I asked how fast it would go he simply stated “It’d Run”, and that he didn’t baby it.